With big jobs and small places in mind, Honda has unleashed the much-awaited Pioneer 500 to its growing fleet of side-by-sides. After making their presence felt by unveiling the multi-purpose Pioneer 700 SXS lineup, Honda also recognized an opportunity to provide a more compact and useful SXS. The Pioneer 500, at 50 inches wide, offers users the rugged ability to fit where most side-by-sides can’t. Not only is it extremely trail-worthy, but it also fits into the bed of a full-size pickup. Needing no trailer and no conventional roads to give it purpose, The Pioneer 500 is a fun and limitless freedom machine. This durable vehicle holds a full-sized list of features in a fun-sized frame. For starters, the look of Honda’s entire SXS lineup appear as streamlined, chiseled sculptures that were obviously made for practical outdoor applications. The Pioneer 500 can have many different looks since it has an unbelievable amount of factory accessories available with the current count at over 46 different items and options available. It also comes in standard Honda red, or olive, yellow, and Honda Phantom Camo®. The design team at Honda made four-wheel drive and double-wishbone suspension standard features all around. Also included, is their unique electric paddle shift design that gives drivers the capability to shift on-the-fly for more power and torque that is only a fingers-length away, and can be accomplished without effort or distraction. One of Honda’s real stand-out achievements with the Pioneer 500 is its price, which features a below-market cost that cannot go unnoticed coming from such a powerful industry giant. Simply put: buyers will be getting the big Honda name for a small market price. 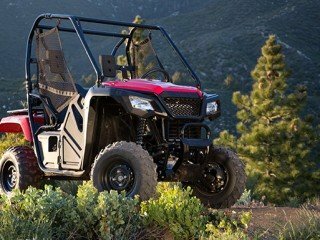 Some more of Honda’s innovative and engineered design features include an inboard-mounted rear disc brake that is hidden and protects against rocks and debris, a large rear cargo rack (450 lb. capacity) and an easy-to-read digital dash. It also comes with an industry-first single-function door and net combo that offers users protection from the elements with light-weight and function in mind. And with its 475cc liquid cooled four stroke engine and 1000 pound towing capacity, it is ready for demanding terrain and demanding jobs. With its industry leading engineering and design, stylistic utility and an affordable price tag, the Honda Pioneer 500 has and endless potential of function and fun.